Trailer Mounted Hot Tub. Although not as flexible in terms of placement, these tubs offer depth and lots of comfortable seating. The tub remains on the trailer, so it can often be leveled better than our portable units which rest on the ground. However, access for a truck and trailer are required. These Hot tubs are great for parties of any type. 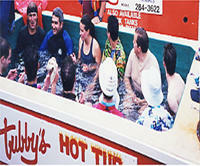 Even if you have a hot tub in your back yard, very few can accommodate the number of people that a Trailer Mounted Hot Tub from Tubby's can hold.